I would like to start this review by saying a few nice things about Lock N’ Load Publishing. There was a minor problem with the copy of this game we were provided with for review. This problem was not discovered until we were halfway through our initial read-through of the rules. Much of the first page of the rules was dedicated to flaunting the companies Game Support Website. “Well-well, they certainly think a lot of themselves,” was my initial thought on the subject. Lo and behold, we discovered a missing chart. Being a well-worn grognard this was not an earth-shattering event, but it did provide the perfect opportunity to test their Support Website. Their support was everything they had indicated in the rules that it would be. Smooth, efficient, and quick to address any issues that may arise with their products. Bravo, Lock N’ Load, well done…Now let’s get back into the box. Component quality of the printing and card stock used in making A Wing and a Prayer is very good. The aircraft counters are one-inch square and well printed, on both sides. Special note here, the flip-side of the counters, used to show damaged aircraft actually go the extra step of having their own graphic of a damaged aircraft not just the same picture, lower stats, and a red stripe or subdued background color. That is a nice touch. To me, small touches like these say that this game was a labor of love. Game Play. When I laid the game out to play it, I was surprised at how much space it took up with the different charts and tables being within reach. Big counters, multiple charts, and play boards equal space. I appropriated a three and a half-foot-wide by three-foot-deep end of our dining room table for my play-through. 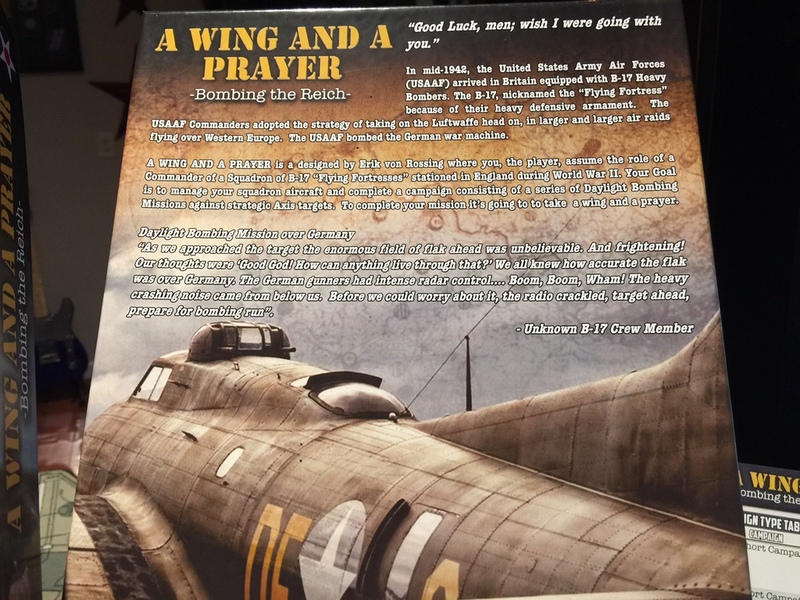 In A Wing and a Prayer: Bombing the Reich, you assume the role of a Squadron Commander in England, sending your bombers into harms way over Europe in the daylight bombing campaigns of WWII. Playing the game conjured up images of the movie and the later TV series, 12 O’Clock High, and playing this game felt like I had suddenly been sent back in time and put in command of a Squadron of my own. This is very much a game of survival. Your flight of bombers, either B17s or B24s, is represented by a marker which is moved between connected area boxes on a Mission Map, from England to the target, and hopefully back safely to home base in England once again. The Mission Map also has a time track for your escorting fighter types. This easy mechanism allows a good feel for the limited range of your escorts. Individual escorts, bombers, along with their assigned crews, and a cloud-cover marker, are placed on a Formation Display board. This more granular representation of your formation is where attacks on your bombers and escorts and any resulting loss tracking will take place. Missions are assigned by a deck of mission assignment cards. There are 2 cards for most targets, one for Undamaged Target, and the other for a Damaged Target. These cards show the target name, the number of bombers and escorts to be assigned to the mission, victory points, as well as the flack value and target difficulty. Speaking of flak, assessing flak damage is a multi-step, multi-D6 affair. The first roll and chart look-up considers flak accuracy/target density and will provide the number of damage rolls each aircraft in the formation must face. The second set of rolls will determine the actual damage done to the individual aircraft by the evenly apportioned damage rolls. Some may say that there are easier ways to get the result, but I say that this method gives a better feel for the experience by significantly raising the tension level in the game. 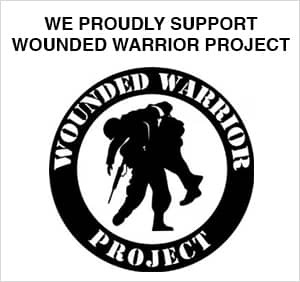 This immersion grows even deeper as we dish out the damage because we are not just damaging flying metal machines, remember, you have a crew marker, one that is printed with pictures of real crews, placed on the Formation Card with each aircraft. These crew pictures serve as a stark reminder that you are playing the part of the Squadron Commander, and these are your people. Assuming your formation survives the flak and the enemy interceptors, you will be faced with the same problem bomber groups faced in WWII. All the blood and guts amount to a waste of humanity if you don’t get your bombs on target. 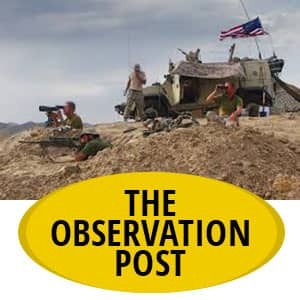 It is easy to forget just how difficult bombing was in the days of yesterday when we look back from this day and age of smart bombs, GPS, and laser guidance. 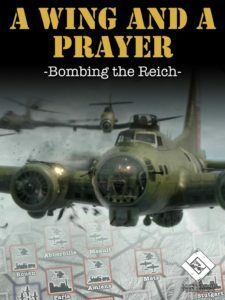 When playing A Wing and a Prayer: Bombing the Reich, you will feel the frustration and other negative emotions that come from failing to put enough bombs on your assigned target, or you will be rewarded with the elation that comes from smashing your enemy. Elation brought on in part by knowing that you will not have to fly through this slice of hell to hit this particular target again. A Wing and a Prayer is a “Wind ’em up and let them go wargame.” Set the mission, assign the assets, let ’em go, and pray they make it home safely as the mission steps you through the game mechanics. The rulebook is very well organized in that it leads the player step by step through a mission with a minimum of page flipping. To me, this is a solo wargame and a very good one at that. The straightforward game mechanics flow smoothly and naturally. 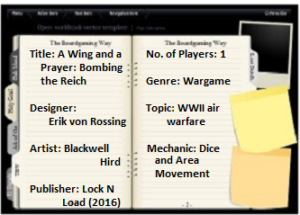 There is a module included with the game for playing with two players, where the second player controls the German assets, but I do not feel that this arrangement constitutes enough game-play to hold the interest of a second experienced wargamer, while it dilutes the experience to be had in solo play. 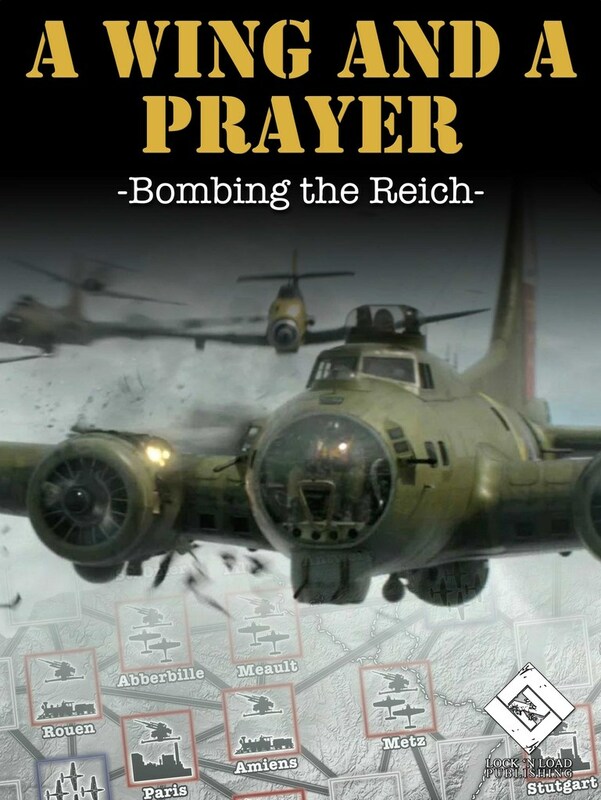 In conclusion, A Wing and a Prayer: Bombing the Reich is a solid game from a solid company. Well worth adding to the “Solo Playable” games in your collection.